Q: Were you ever (Coach Osborne’s) fail-safe so he didn’t forget wedding anniversaries, birthdays, things like that? Q: And obviously, you were probably a guardian in seeing some nasty mail and that type of stuff arrive, too, right? MLW: Yeah, unfortunately. But surprisingly, even after that first year I worked there and he went for two? Well, they had those Postal Service baskets, I don’t know why but they called them ‘FREDS’ or something like that. They would bring in one of those every day –completely full- I don’t know how many days after that game, and that’s how much mail we would get. And out of those (and I tried to keep track: I’d take it home at night and I’d open them as I was sitting at home, just because there was so much mail! To open it took forever! ), but out of those there was probably one in two hundred to three hundred letters that would be negative. All the other ones of those would be positive: “We would have done the same thing. We admire your decision.” And so there wasn’t a lot of negative mail, which was interesting, too. Q: I have to say, Mary Lyn, I was a freshman in high school and I was profoundly affected by that two-point attempt. 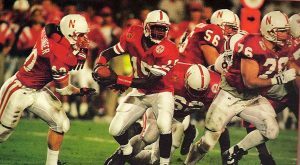 Q: Yes, I think many people in the state of Nebraska learned a lesson from that historic play call. 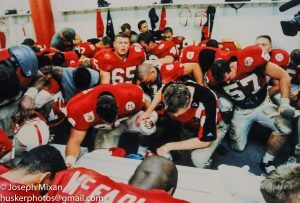 It made me realize that it’s always about more than winning: you’re there for a purpose, you put it all on the line, you have to be willing to take chances and stick to your guns, your principles. Maybe it was just me, but I think that had a profound effect on my worldview and goal-setting and personal accountability. MLW: Yeah, and I think it did a lot of people. It made you sit back and think, ‘Hey, we could tie this and win the national championship that year.’ But it is more than that. Hopefully that touched more lives. That’s interesting you say that. Q: Let me tell you, after I left the University I traveled the United States extensively with the Famous San Diego Chicken and I’d run into people from all walks of life -even those who knew next to little about college football- but whenever folks found out I was from Nebraska they would bring up Coach Osborne and his going for two and how much respect they had for him doing that.” Oh, Nebraska? 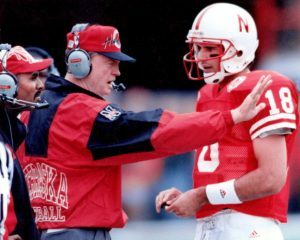 Tom Osborne. That’s the guy who went for two.” And they’d say it with reverence and respect and an admiration. That was a great moment in television history, in Nebraska history, if you ask me. Q: And what, twelve years later, finally, in that same end zone going for two and tying it up and then beating Miami? A dozen years of clawing to make it a success, you know? Which brings me to ask: do you have a favorite game? MLW: Well, I went to all the home games. And gosh, it would have started in ’91, I guess it was, the first year my daughter was born was the first year that they started taking the staff along to bowl games. Before that I heard that the players’ wives and stuff would sometimes type the practice schedules and they would kick in and come. And finally the staff needed to go, as well, because we have these practice schedules and we’d have all that stuff we needed to do. So from that year on we got to be part of the team. We got to be on the team plane and got to bring our families, and we set up an office. So we got to go to all the bowl games. Q: Do you have a most memorable road trip? MLW: I probably liked the Phoenix one, the Fiesta Bowl we won after the ’95 season. It would have been Christian Peter and those guys. I remember my folks came to that game. They live in Auburn and they caught a ride out there to the Fiesta Bowl and got to go to the game. And a lot of the players go home directly from the bowl game and then there are empty seats on the plane, so I brought my folks back on the team plane. And that was always just so special to me. My mom and dad had never flown before. But anyway, when we came back it was just amazing, because there were all these people lined up on the streets from the airport to the Devaney Center! It was just amazing the number of people who turned out for that, and the look on my parents’ face taking a part in all of that? And then going to the Devaney Center and being totally full of people? Some people were turned away and they were standing outside because they couldn’t even get into the Devaney Center. My son Thomas was pretty young, and I’ll always remember Christian Peter was so excited, he picked him up and my mom took his picture. And to this day we have this huge picture of Christian Peter holding Thomas. And they both were just smiling! It was so cool. So that is probably my favorite. There were a lot of them. But the whole thing? That whole trip just worked out so well. Q: That leads me to ask if there were any players you got to know better than others, who stand out to you from those days? MLW: There are a lot of them that stand out, especially the ones who would take time to stop by. One who was very special to me, (and I have a daughter named Brooke and a son named Thomas- so when Tommie and Brook were quarterbacks that year, you know, that was always kind of neat) I remember Brook always used to come in my office and I’d have a rock station on my radio, and he’d always come in and turn it to country. (laughs) I’d go, ’Brook!’ (laughs) It was just his thing. He liked country and he would always mess with my radio. And now, to this day, I like country. And I can give him credit for that. (laughs) So that’s kind of cool. And I don’t mean for this book to be about me, though, because it’s about the players. But I remember that bowl game because I have pictures of Brooke with Brook and Thomas with Tommie. I just always thought that was kind of neat. Brook was awesome and his family was so awesome, and that was such a tragic thing. 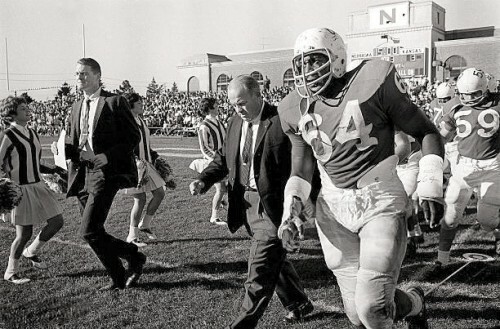 Q: I’d moved out here to San Diego only about a month before the plane crash happened, Mary Lyn, and I arrived home and turned on ESPN and saw the news. I recall just sitting there all alone on my couch, dumbstruck. I just sat and cried. MLW: That whole thing with having the FCA Banquet that night and the poster of a little kid wearing a number 18 jersey? (Because that was Brook’s number.) It was unfortunate. He was always special. But there are so many, I couldn’t even start to name them all: The Peter boys, the Makovicka boys and the Kelsays, and it goes back to the Stan Parkers. 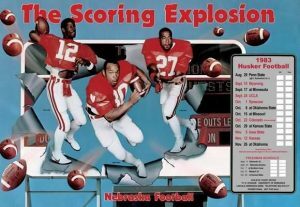 And I still talk to Mike Rozier. Sometimes he’ll just call out of the blue if he’s gonna be in town. It’s just fun. Q: Mike was kind of a joker, no? MLW: Oh yeah, he was the ornery one. He would park in the parking spaces he wasn’t supposed to. MLW: I can’t remember. One time he parked in Tom’s space or Bob Devaney’s, but he would always park where he wasn’t supposed to and he’d come up in the office and he‘d smile. (laughs) Mike was so ornery. And to watch all those guys together was something. And I know there’s always talk about the Scoring Explosion, but another one was Neil Harris, who also played that year. And he came down from Lincoln to Brooke’s graduation in May, I guess it was. And he just always kind of kept in touch. He coached Brooke in basketball when we lived in Lincoln and Brooke played on the select team for him, and he’d always had a special affinity for Brooke and followed her and her volleyball team’s success. And I just thought that was so cool that Neil Harris would come down here to the graduation party, so it is kind of like a family. You keep in touch with those guys, it’s awesome. Q: Like most any family, I’m sure there were some days the coaches didn’t quite get along with each other all the time. Where there ever any coaches who took losses harder than others? Q: Could you tell before the Oklahoma game? Was it usually a different kind of a week, from your perspective? MLW: I think the coaches tried to make each game just another game, because that’s so important for the players. If there was (there probably was a little bit), but they definitely tried to hide that. But the whole thing is the consistency and keeping things going each week the same way to get into a routine. Q: Keep things on an even keel and in a groove, so to speak? MLW: You’d very seldom hear the coaches raising their voice, and if they did the player deserved it. (laughs) A few ‘dadgummits’ from Tom, but not very many. But they deserved it when there was a dadgumit. Q: Anything other than a dadgumit? MLW: Oh, no. That was all. It was no cursing or anything, at least from Tom’s perspective. That’s what I would hear, because I was in the office by him there. Q: Was there another secretary who assisted the other offensive coaches? MLW: I assisted the offensive staff and Joni Duff would take the general calls and assist the defensive staff. She did the equivalent of what I did for offense. She did the defensive practice schedules, the defensive notebook and game plan and all that stuff, as well. MLW: (laughs) Yeah, I’m very glad I worked for offense. (laughs) I got along with the defensive coaches, too, though. Q: Any personalities stick out to you? As far as being unique people? MLW: I actually started working there at around the same time Frank did. When he started as the freshman coach we worked closely, since he ran the football school. He was the head person and I did the bookwork, so Frank and I kind of went through it and assisted at the same time. And I totally admire him, as well, and Tom picked him for a reason. He deserves respect, too. Tom picked him. Tom knew so much about football, and Frank did an awesome job the years he was there. He needs to get a little recognition and I appreciate that Bo’s given him that. Q: When was your last year there? MLW: Frank got fired and then I worked with Bo during that bowl game, and then they hired Bill. So I worked with Bill through spring ball and through football school and stuff like that, and then I ended up I couldn’t do a full football season. But now I’m happy that they’re all back, so I want to forget those years. Tom’s back and Bo’s back, so I’m happy again. Q: Well, Mary Lyn, I am so thankful that you’ve given me your time. We’ve spent more than an hour here. MLW: Wow! Have we been on that long? I just wish to say, please make this whole book be about the players and what’s important, okay? Q: Sure thing. And I probably told you this earlier, but I always ask the players and coaches to give me the name of somebody who did a tremendous job behind the scenes, and your name was brought up, so I simply had to profile you. It was an off-the-record interview so I can’t divulge the individual, but he mentioned you and Joni specifically. So I’m very appreciative of your time and your service, Mary Lyn. Do you have any parting shots before we end our time here? MLW: Just to never lose sight of your goals. That’s one thing that Coach Osborne really taught me: every week they would set goals. And they’d go over them every week whether they made them or not, marking them either black or red. And his faith? That’s everything. Just don’t lose faith in what you’re trying to accomplish in the end. Never lose that focus. “Never lose that focus.” Funny, but from Mary Lyn’s interview you get the feeling that the main focus wasn’t entirely on football. It’s almost as if Coach Osborne was using his position as springboard to serving as a guardian, caretaker, father, mentor-like figure to as many young men as humanly possible and, “Oh, by the way, let’s prepare to win some football games while we’re at it.” I find this extremely admirable and very motivational, as it provided the entire athletic department staff with a greater sense of purpose. Even if you won ‘em all, what does that matter if you didn’t win the kids’ hearts and set them on life’s way? Mary Lyn’s retelling of Tom’s parable about each individual human being’s worthiness kind of summed it up for me, too, when the man questioned, “”Why do you do this? There are so many of them. Why would it make a difference?” And the man said, “Well, it means all the difference for this one.” …I thought that really meant something, about making a difference for just that one. 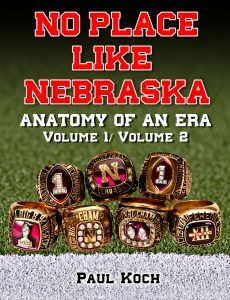 It says something about him.”” When you think of Kevin Ramaekers from his earlier interview, about Tommie Frazier, about Brook Berringer, about Riley Washington, Tyrone Williams, Christian Peter, Lawrence Phillips, Scottie Baldwin and hundreds more, Tom Osborne valued every person and the worth they possessed beyond the realm of any football field. That’s what made him a coach and a leader rather than an egomaniac and tyrant, which happens to many a high profile college coach. It also made him lean heavily on his faith in Jesus Christ. He needed that faith during 1995, and then some.